Here are my most recent portraits done in pencil in the same sketchbook (on unknown folio paper). The drawing to the left was my attempt at drawing a moving portrait as my son would just not sit still. His hand is crude as you can see. I basically gave up on this one and did no pursue it further. 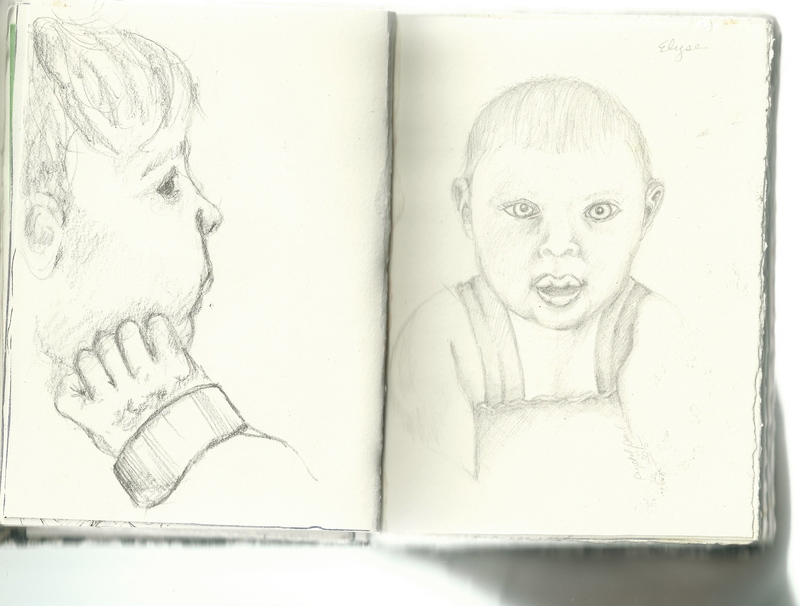 The drawing on the right is of my niece Elyse when she was a year old. I drew it from a photograph and in a harder pencil than the one on the left. The ears tripped me up a bit in this, and although the photograph here is not seen, her face is a big longer that the way I drew it. Otherwise I think it is a pretty good likeness! As you can tell, I do not have time to do a drawing a day! My twins take a lot of my time, but I’m still trying to complete at least one or two drawings per week. I think if I could simply settle on the idea of actually “sketching” (you know, quickly) then I would get more done. My works are so tightly drawn that I feel as though I sometimes find myself focusing too much on accuracy and the fun and ability to be whimsical escapes me.